A new cut-to-length line at United Performance Metals has set production records while producing blanks that transfer directly to box skids—a huge time and cost saver. meet the unique needs of that industry. Over the years the company, as Ferguson Metals, diversified, providing stainless steel to customers in other markets as well, including automotive, medical, food service, electrical and petrochemical. In 2006, Ferguson, now named United Performance Metals, added 39,000 sq. ft. of warehouse and processing space to its Hamilton, OH, 82-employee location, bringing total square footage to 109,000. Prominently displayed in the recent addition is a state-of-the-art cut-to-length (CTL) line from Red Bud Industries, Red Bud, IL, which adds to the company’s existing slitting, shearing, edging and leveling capabilities. The new line contains a 50,000-lb.-capacity reel and coil stage-and-load system, peeler breaker, crop shear, two Herr Voss levelers, dual-motor grip feed, variable rake shear and stacking system. The new space and the CTL line grew out of the company’s commitment to lean manufacturing. Prior to purchasing the new line, United Performance did have a pieced-together CTL with much of its supporting equipment old and worn, according to company officials. Essentially, the line could not produce the flatness tolerances required by the company’s customer base. The new CTL line handles coils to 50,000 lb. and from 0.015 to 0.130 in. thick, with the ability to deliver ±0.005-in. length tolerances. The ability to hold length tolerance also has benefited the company. 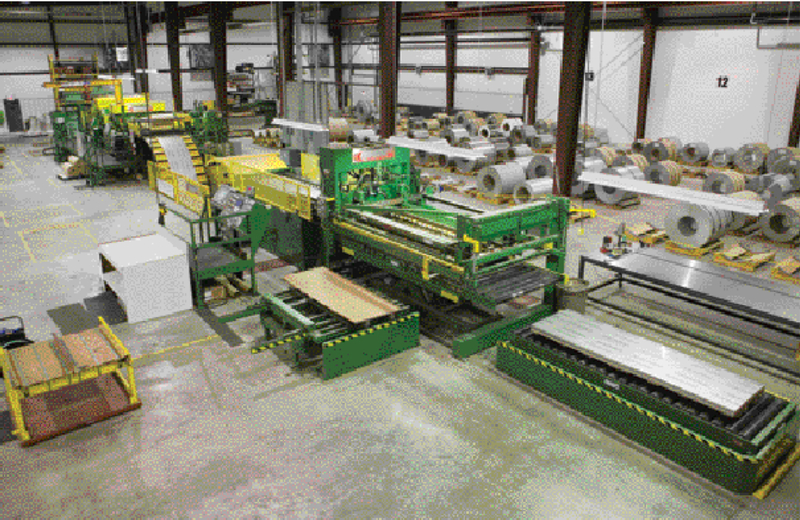 One job for example, the production of 15-in.-square stainless-steel blanks, required cutting of full sheets on the old line, then transfer of the sheets to a stand-alone shear to obtain the correct size. The company had to double-cut due to lack of precision on the old line as well as waste time and manpower hauling material for multiple operations. A key feature of the new line is its ability to stack blanks directly into box skids, according to company officials. The addition of a looping pit on the line results in less stops and starts, meaning less opportunity for marks on valuable surface-critical material. prior to shearing and then arranges blanks in a perfectly square stack in a box skid that lowers automatically as the blanks stack up. Company officials estimate annual savings of $103,000 due to the productivity gain and the fact that box skids are less expensive to purchase than flat skids with boxtops. Another plus of direct box-skid loading: reduction in damage to high-priced surface-critical sheet that may result from excessive handling. The line also employs a dual-motor grip-feed that processes surface-critical material without leaving a mark; a looping pit also helps to eliminate marking. 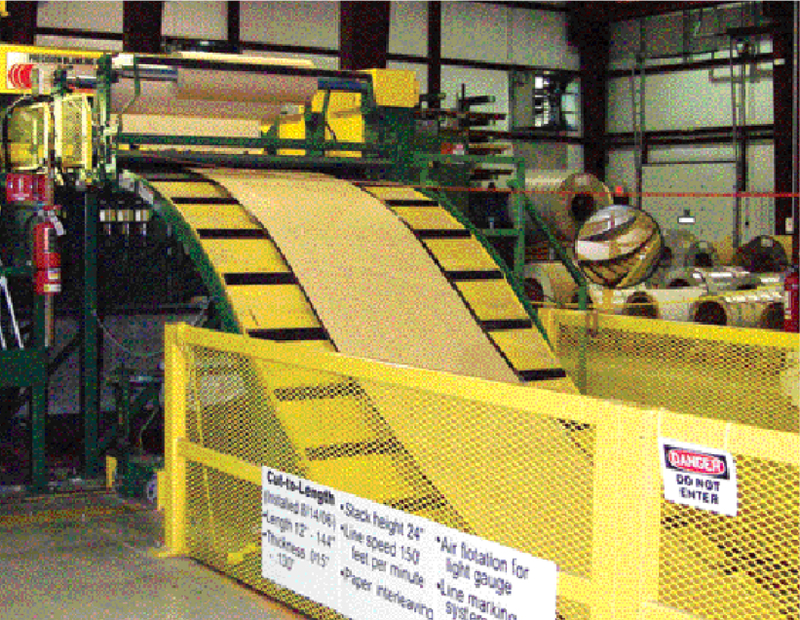 “The prior line did not have a looping pit to accumulate material, so the entire line would stop during sheet cutting, creating the risk of marking material via starting and stopping,” says Haire. All of that is important, as United Performance works with high-value materials, some grades purchased by the company for as much as $50/lb. With customers expecting perfection, blemishes can result in costly scrapped product. Testament to efficiency gains, less than three weeks after commissioning, United Performance Metals set a production record on the new line, which produces at twice the speed of the old line. The company will soon add a scale to the line’s stacker pan, removing another added step: moving blanks to a standalone scale during processing. All told, the productivity improvements have opened up capacity and allowed the company to take on more work. The addition of the CTL line fits nicely into United Performance’s ongoing lean efforts. The lean drive really began with the new addition, laid out so that material enters via the receiving docks and takes an orderly, minimal route through slitting and blanking and flows toward the shipping door.